How do we help our students develop a Biblical worldview without just turning them into puppets who can parrot back the “right” answers? How do we instill in them true wisdom and get it from their heads into their hearts? How do we integrate Biblical truths into our curriculum? And how does this jive with the goal of having measurable standards? These are some great questions that Eric Reenders contemplates in his book Rooftop Perspectives. And while he doesn’t give all the answers, he starts a vital conversation and gets his readers thinking about these important questions – which is the whole point anyhow. Rooftop Perspectives starts with an intriguing narrative that will draw you in and make you wonder what’s coming next. John, who teachers in China, is plagued by questions, doubts, and frustrations about his work and its purpose. But through his interactions with LiuPing and the intriguing tale that he tells, John starts to find some answers. Or more accurately, he starts to ask the right questions. Towards the end of the book, the reader will experience an incredible shift from fiction to application as John experiences a string of exciting epiphanies. And it wasn’t just John who was excited. I found myself wanting to both slow down to digest these great thoughts and simultaneously read faster to find the next revelation. John comes to realize that it’s not really that important for an objective to be measurable. Instead, what’s really important is a shared focus on the right things. As Christian teachers, we should desire to impart wisdom to our students, and a Biblical worldview is the very definition of wisdom. We want our students to be redeemed, and if they are, how will we know? They will think like Christians. They will have a Biblical worldview. John then contemplates how he can truly impart a Biblical worldview into his students. Since it’s not enough for them just to repeat back the right answers, John knew he needed something more. The answer? Questions! Rooftop Perspectives provides a plan that builds on focus questions that can be implemented at the classroom, departmental, or school-wide level. These questions are meant to focus the students’ attention and to get them to think in the right direction. As teachers guide the students to find the answers for themselves, the students find the truths that they will hold to. Rooftop Perspectives lays the foundation for an incredible plan to reach students, whether you teach in a Christian, private, or public school. But it does something even more important – it prompts us all to discuss this important issue much more. 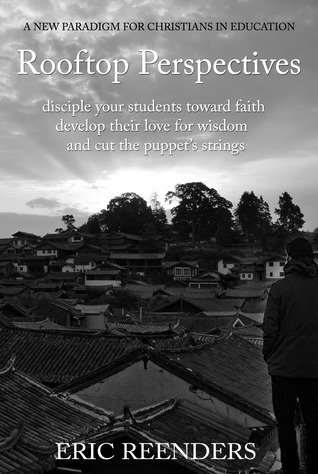 There’s nothing more important that discipling our students and helping them develop a strong faith for themselves. We can and must be more strategic and coordinated in our efforts, and I believe this incredible book is one of the first steps in the right direction. Leave a comment, like our Facebook pages, and/or follow us on Twitter to earn entries. If you’re reading this by email, click here to enter. Links may be monetized, but opinions are my own. Can’t wait to read the book. It’s always nice to get a new perspective on the work God has given us.